Ghosts, goblins, witches, wizards, zombies, and more will be wandering the streets of downtown Bangor on Saturday, October 27 from 2 p.m. to 4 p.m. at the annual Downtown Bangor Halloween Trick or Treat. 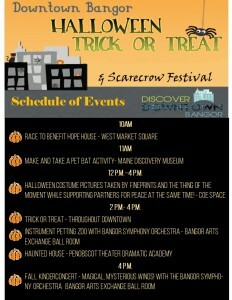 This event is a safe way for families to trick or treat during daylight hours at businesses throughout downtown Bangor. -Get your Halloween costume pictures taken by FinePrints and The Thing of the Moment while supporting Partners for Peace at the same time! 2 p.m. – 4 p.m.
-Haunted house located in the Penobscot Theater Dramatic Academy at 131 Main Street.